The Yahoo! Maps Simple API enables you to overlay your data on Yahoo! Maps, allowing you to create custom map displays without programming. Simply pass geoRSS tagged XML files to our servers and your data will be displayed on a Yahoo! Map, complete with features like overlays and annotations. xmlsrc string (required) Either an XML string, or a URL to an XML file. If a URL is used, it must be accessible through a standard HTTP connection. Details on the format of this XML are below. The Yahoo! Maps Simple API returns HTML containing the generated map inside a Yahoo! page. title string (required) The anchor text for the URL specified by the link. url (string): The URL of the image file. title (string): alt text for the image. description (string): text displayed beneath the image. link (string): a URL to specify where the description should link if clicked on. geo:lat floating-point number The latitude for the center point of the map. If geo:lat, geo:long and ymaps:ZoomLevel are all specified, any point outside the map borders will not be shown. geo:long floating-point number The longitude for the center point of the map. ymaps:IntlCode string Two letter language code. This replaces the default language code in the HTTP header. defaultViewNumbered (Boolean). If set to true, the icons on the group legend will be numbered unless overridden by a BaseIcon definition. title (string): A title for this group, to be shown in the legend. id (string): an id string to allow this group to be referred to in item elements (which may then use the group icon if one is specified). item enclosing tag Describes an individual item to be placed on the map. Full specification for the item element is in the table below. title string (required) The title of the item, displayed next to the icon on the left-hand side and as the title of the popup information box. link (required) string A URL to link this item to an external webpage. Links the text specified in title. description (required) string The free text in the body of the popup information box. ymaps:Address string The street address of the location. Anything Yahoo! Maps is able to recognize as a valid address can be used here. ymaps:CityState string The city and state/province of the location. ymaps:Zip integer or <integer>-<integer> The five-digit ZIP code, or the five-digit code plus four-digit extension of the location. ymaps:Country string: default us The two-letter country code of the location. ca and us are currently supported. geo:lat floating-point number The latitude of the location. If geo:lat and geo:long are not specified, ymaps:Address, ymaps:CityState, ymaps:Zip and ymaps:Country are all required. geo:long floating-point number The longitude of the location. ymaps:PhoneNumber string The phone number for the location, for display in the popup information box. ymaps:GroupId string Assigns this item to a group specified in the ymaps:Groups. It will default to using the icon for that group unless overridden by ymaps:BaseIcon. ymaps:BaseIcon string A URL to a GIF file, which will be used as the icon to represent this item on the map. ymaps:HoverIcon string A URL to a GIF file, which will be used as the icon when the mouse moves over the BaseIcon on the map. Defaults to the BaseIcon. ymaps:PopupIcon string A URL to a GIF file, which will be used as the icon when the user clicks on the location on the map for more information. Defaults to the BaseIcon. href: The URL that this link should point to. An item may contain multiple instances of this tag. link (string): a URL to specify where the image should link if clicked. ymaps:ItemUrl string A URL pointing to html content that should be displayed in an IFRAME inside the popup information box. Only one ItemUrl may be used per item. If you want to embed Yahoo! 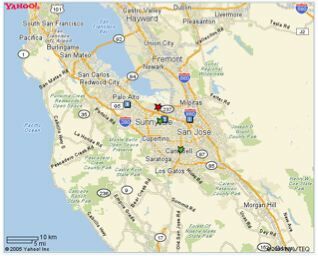 Maps in your web site or application, try our embeddable APIs - Flash and AJAX APIs.